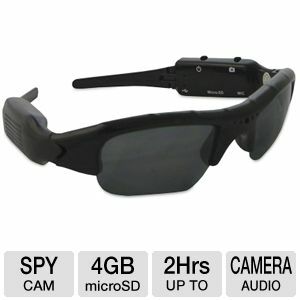 Night Owl CS-SUNB-4GB Covert Video Sunglasses with 640 x 480 resolution, up to 2 hrs Audio/Video recording, 30 FPS, with 4GB micro SD card. It records audio from 20feet away. So buy this Covert Video Sunglasses to record secretly at very low prices from different online stores.